Walnut Street Bridge at Night | Just Shooting Memories! 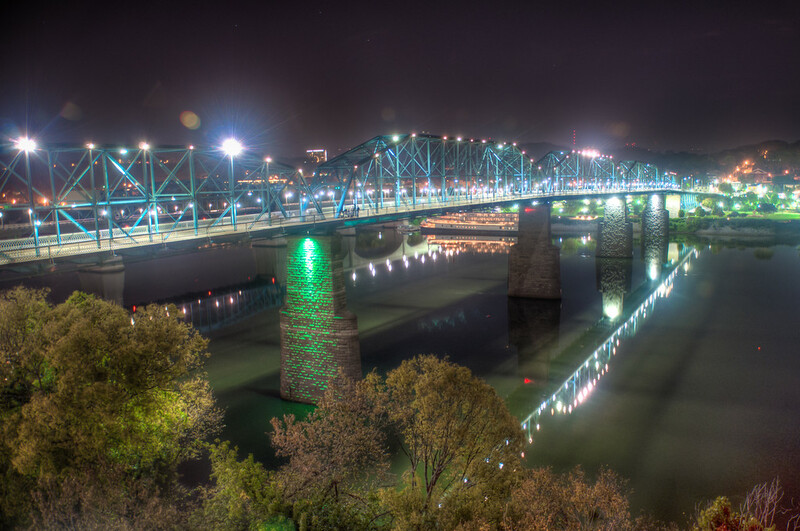 Part of the reason I like Chattanooga Tennessee so much are the bridges. All of them are picturesque, but one must stand out from the others. I believe it is the Walnut Street Bridge. During the day in the summer, the blue framework of the bridge contrasts with the gray/brown of the water and the green of the surrounding foliage. At night, the bridge comes alive. It is lit from end to end and the navigation lights on the supports shine brightly. I stopped by the observation deck at the Hunter Museum one night to get this shot.